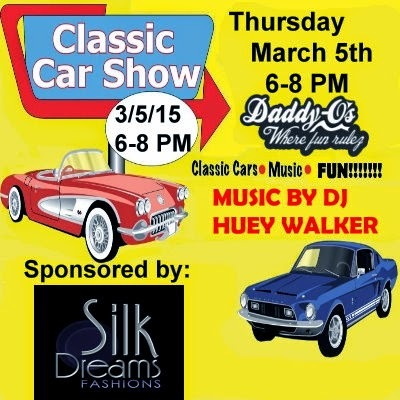 Join us at Daddy-O's for a Classic Car Show Party sponsored by Silk Dreams Fashions. Everyone that attends can rezz one Classic car or pick up (under 50 prims please) so this is your chance to show off your car! If you build classic cars feel free to set the one you rezz for sale! DJ Huey Walker will take the stage in our new Sunset Park/Drive In Theater area so there are plenty of spots for the cars. Huey will be playing songs from the era of the cars as well as songs from his vast list - including your requests. Our sponsor Silk Dreams Fashions has provided a 500L gift card for us to raffle off and ladies you do not want to miss that! Plus we will have at least one 1000L sploder pot so grab your significant other, your friends and your fav car and join us for a fun night with your friends from Daddy-O's - WHERE FUN RULEZ!